Building Materials Direct are suppliers of a massive range of facing bricks from the largest brick manufacturers down to the smallest independent brickworks. Dealing with the major brick distributors across the country means that Building Materials Direct are able to source from companies such as Ibstock Brick, Wienerberger, Hanson Brick, Freshfield Lane, Baggeridge Brick, Michelmersh Brick, Northcott Brick and many more. Whether you need one pack of bricks for that garden wall or a full load to build the home of your dreams Building Materials Direct are on hand to help. 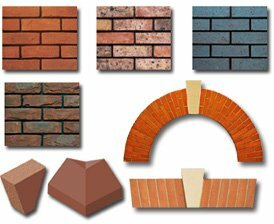 Building Materials Direct are also suppliers of a vast portfolio of special shaped bricks including Angle Bricks (Dogleg Bricks), Plinth Bricks, Cill Bricks, Cant Bricks, Arch Bricks, Pistol Bricks, Slip Bricks along with other different special Shapes these are available in either purpose made or cut and bonded versions. Cut and bonded versions generally require the bricks to be collected from site and returned once processed although in some instances bricks can be supplied direct. If a Special Shape Brick can be made Building Materials Direct will almost certainly be able to supply. Why not give your project that finishing touch and save time and money with purpose made lightweight brick arch systems available from Building Materials Direct. These along with other decorative purpose made brick panels such as Brick Basket Weave Panels and Brick Stackbond Panels can add that touch of class and finish off your selfbuild dream home. Bricks are collected from site to manufacture these items to ensure consistency in colour and the finished product returned sometimes within 7 working days dependant on requirements. Get A Quote:- If you require a price on standard facing bricks then please do give our sales office a call, we will require the name of the brick required along with a delivery postcode, the quantity required and if there are any site restrictions for delivery vehicles. For any special shaped bricks and purpose made arch or decorative panel enquiries please Contact our sales team and they will talk through the information required to enable them to prepare a quote.